Planning a wedding can be a major headache. You’ll need to find a wedding venue, hire a catering service, deal with a host of event vendors, and so much more all before saying “I do” on your big day. And that huge amount of planning leads many to hire a professional wedding planner to organize their event. But not every wedding planner is alike. Some will work their hardest to make sure your big day is a big success, while others will do the bare minimum expected of them. And it’s difficult to gauge how your planner will perform until you’re actually working on your wedding. So, how do you choose the perfect wedding planner? Luckily, the team at Hollywood Banquet Hall is here to help. Read on for some tips and advice to help you choose the right planner for your wedding. You don’t want to waste time when picking a wedding planner. The sooner you can lock down the right professional, the sooner you can sort out the details of your wedding. That said, you shouldn’t just pick the first planner in your area who comes up in a Google search. Be sure to start your research in advance and look into different options. You’ll definitely want to do plenty of searching online, but you should also get suggestions from friends and family in your area who have had recent weddings. They might be able to recommend a great, trustworthy wedding planner. Does Your Wedding Venue Have Suggestions? You want a planner that will be able to handle any special requests or problems at your wedding venue. And assuming you’ve chosen a venue before you choose your planner, it’s worth asking your wedding venue contacts if they recommend any professional planners in your area. Your venue might even offer wedding planning services in addition to standard venue service, providing everything you need from one vendor. At Hollywood Banquet Hall, we offer expert wedding planning services to guide you through the process. Our skilled team will make sure every aspect of your wedding exceeds expectations. 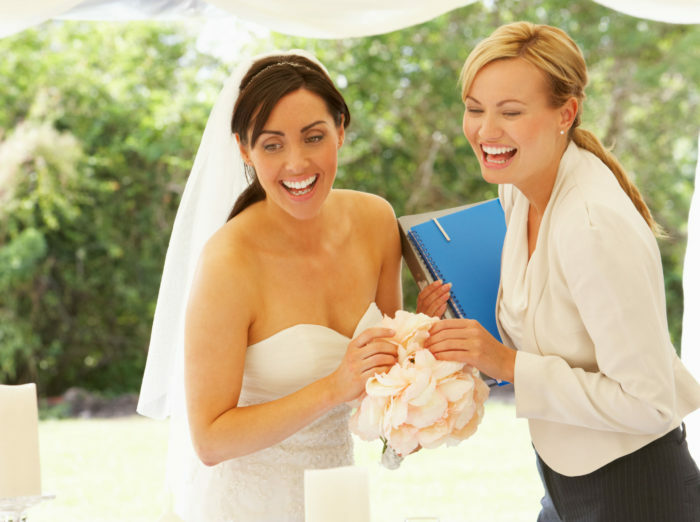 A wedding planner’s job is to make you feel confident that your wedding will go great. And while many can deliver on that promise, some are all talk. To make sure your prospective planner can actually make good on their promises, be sure to check some of their references. It might feel a little awkward, but there’s nothing wrong with asking a planner for their references before hiring them. Their business relies on positive word-of-mouth, and a true professional will be able to provide glowing references at a moment’s notice. If your potential planner is apprehensive about providing references, or just has bad ones, then you’ll definitely want to find someone new. Your wedding is a once-in-a-lifetime event, and you’ll want to work with a planner you feel comfortable with. As you start meeting with different wedding planners, be sure to dig deep into their professional lives to get a sense of what they can provide for you and how they handle the job. You can think of meeting wedding planners as holding job interviews. You wouldn’t want to hire someone who will make you feel awkward while working. Be sure to get a sense of why they became a wedding planner, how they work under pressure, and how successful their past weddings have been before making your decision. The final element of hiring a wedding planner is the contract. This formality will ensure that all parties involved know exactly what services will be provided by the planner, providing the peace of mind you need as you gear up for your wedding. Most planners will have standard contracts of their own, and you’ll want to be sure to read over that paperwork before signing. Finding a wedding planner can be tough, but if you start early, research different options, and stay open-minded, you’ll find the perfect pro to make your wedding dreams a reality. And if you’re looking for a wedding venue in Los Angeles, consider Hollywood Banquet Hall. Our event venue offers ample amenities and accommodations, including wedding planning services, guaranteed to impress your guests. For more information on booking and availability, contact Hollywood Banquet Hall today.